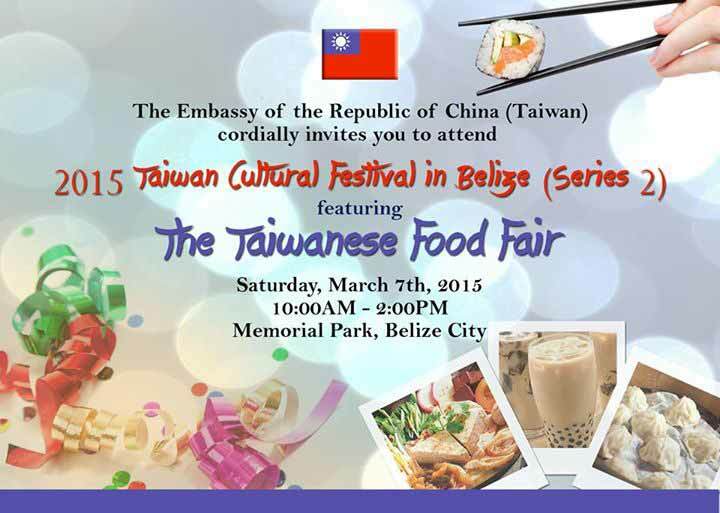 The Embassy of the Republic of China (Taiwan) has been promoting the cultural exchange between Belize and Taiwan. The Embassy will host “2015 Taiwan Cultural Festival Series 2” on March 7th featuring “Taiwanese Food Fair”. More than 30 kinds of traditional Taiwanese fine food will be presented at one time including spring roll, car wheel cake, honey sweet potato, pepper and salt chicken, roast chicken, sweet and sour chicken, pork strip, Taiwanese sausage, various kinds of dumplings, tea-flavored egg, glutinous oil rice. Besides, there are oden, vegetarian vermicelli, chilled noodle, sushi, fried tofu, indigenous Paiwan cuisine, and other well-known desserts such as mochi, sun cake, and taro cake. Of course “bubble milk tea” and various kinds of tea drinks are indispensable. There are also booths for face painting, twisted balloon and fun games. You will definitely enjoy plenty of pop music of Taiwan and the performance of Belize Pantempters Steel Orchestra. Don’t miss the feast! Welcome to the Food Fair with your family and please invite all your friends to join us!